Have you ever doubted your relationship with God? Wondered if He really hears you when you pray? Contemplated the surety of your salvation? One of the ways I know that I know that I know that I indeed have a relationship with the God of this universe is that I'm able to look back over the course of my life and see real growth. I'm not claiming, by any means, to be fully matured as a Christian. I'm very much a work in progress. But that "work in progress" is exactly what assures me that I have Christ in me, the hope of glory! Can you look back over the years you've known Christ as your Savior and see evidence of His handiwork? Better yet, can you look back over the past 12 months and see that you have become more like Christ in your attitudes, your actions and your words? Still better, can you see evidence of growth in just the past month to six weeks of your life? If I were to ask you to tell me what God has been teaching you just recently, could you give me at least one or two lessons you've learned at His holy feet? I hope you can, but if not, don't be intimidated or dismayed. I've found that many believers in Christ know that their salvation is sealed, but they also realize they are not growing in their faith. Maybe that's the case with you. Maybe you notice others around you changing, growing, developing in their faith, but you are not. Maybe no one has ever told you how you can grow as a Christian. This little series of posts may not be for everyone. But even if you're already growing vibrantly in the Lord and in your faith, you may find a few nuggets of wisdom from these simple posts to share with someone else. After all, if you're growing in your relationship with our Lord, you really ought to be discipling someone else as well. If not, maybe you could take these posts and begin pouring into another younger Christian...a daughter, a young girl or woman, a neighbor, a new friend. 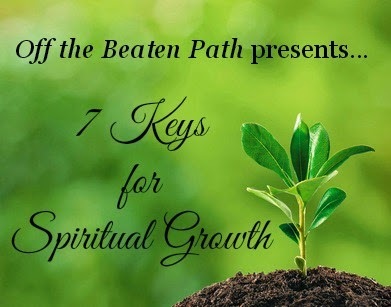 So for the next couple of weeks I will be posting 7 Keys for Spiritual Growth. These are simple discipleship tools or spiritual disciplines that help us to progress in our relationship with Jesus. I hope you'll join me, leave a comment with a question or suggestion, and pass what you learn along to someone else. After all, if we're not growing, we're dying on the vine! By the way, what has God been teaching you lately?